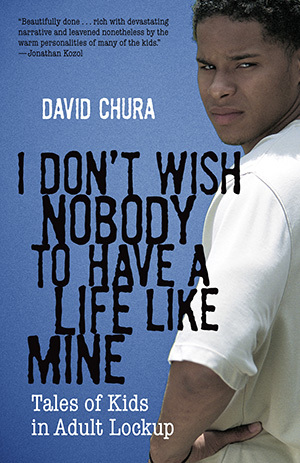 David Chura taught high school in a New York county penitentiary for ten years-five days a week, seven hours a day. In these pages, he gives a face to a population regularly demonized and reduced to statistics by the mainstream media. Through language marked by both the grit of the street and the expansiveness of poetry, the stories of these young people break down the divisions we so easily erect between us and them, the keepers and the kept-and call into question the increasing practice of sentencing juveniles as adults. In 1995, I started teaching high school kids locked up in a New York county jail after working with at-risk teens for thirteen years in a community alternative school. Somehow I always knew I’d end up in jail. Maybe it was the company I’d kept over the years. Inner city kids, homeless old guys, and soup kitchen moms lined up to feed their children, teenagers pushed to the margins of society by drugs and by families and communities that didn’t want them. My eyes were opened during the v´60s to the “other America,” the poor, the disenfranchised, the outsider. I got my first lessons in the millstone life of poverty and neglect the summer before college when I worked at an inner city neighborhood center in upstate New York where I grew up. Then, while I was in college, I helped out at a homeless shelter serving meals, giving out clothes, and listening to the desperate stories of the people whose lives and worlds had crumbled around them. But the people who came to the shelter weren’t the only ones being pushed to the edge of society by a country at war with itself. Young men my age were being drafted to fight in Vietnam. Many fought, many refused, many died, and my friends and I stood at the gravesites of more than one classmate. Until I came to my own decision. I dropped out of college to file for conscientious objector status and, for my alternative service, worked in a psychiatric hospital in Westchester County, an affluent suburb of metropolitan New York, with young people abandoned by families, friends, and in many case, reason itself. When I returned to college to complete my degree in literature and in psychology--combining my two passions--I knew that I wanted to work with troubled teens because by then I saw that they were the real casualties of our culture, society’s young throwaways, fundamentally homeless whether living on the streets, in derelict cars, or in overcrowded shelters; in poorly funded and poorly run group homes; or in families, intact or splintered, ravished by drugs and alcohol, crime and violence, abuse and neglect, poverty and disease. For several years after college, I worked in a community crisis center training other counselors and helping clients, mostly young people, through the dilemmas that crippled their lives and happiness. Then, after several years of doing this intense intervention work, I decided the classroom would be the place where I could engage kids in the more positive aspects of who they were--their energy, their creativity, their fresh way of looking at the world--and give them a reprieve from the chorus of woe that sirened through their lives. In 1982, I walked into my first classroom as an English teacher at a regional alternative high school in Westchester. The program was designed to work with kids from across the county whose districts couldn’t handle them. Although students were expected to follow the same standardized curriculum as their counterparts in their previous schools, how that was done was left up to the resourcefulness and tenacity of the teaching staff. In the 1980s and the early v´90s, many districts used alternative education as dumping grounds. The young people sent to these programs were seen as trouble--to teachers and administrators, to the neighborhood, to the police, to the community. They were rarely seen as what they really were--trouble to themselves: the senior graduating as a result of social promotion who still couldn’t read past a third-grade level; the bright but pregnant fifteen-yearold who was college-bound, but now couldn’t get herself up in the morning and on the bus; the drug user and the drug dealer who were more addicted to the streets than to school; the kid who couldn’t let a rule go by without challenging it and the teacher who issued it; the special ed student whose classification was dropped to save a district money; the fighter, the isolate, the bully, the victim. Yet, while the districts might have seen alternative schools as dumping grounds, the students and staff in these programs saw them as safe havens. My school was small, personal, and tolerant. Even though students came from a variety of towns--rich and poor, rural and suburban, diverse and segregated by money or race-- everyone, including the principal, was on a first-name basis. It was a small attempt to bring down “the system” that had tripped up so many of our kids with its rules and regulations. For most of my years at the school, there was a calm and security that many of my public schoolteacher friends reported was rapidly eroding in their classrooms with stories of guns, gangs, and teacher assaults. Our students might have been trouble elsewhere, they might have resented being kicked out of their home districts and banished from their towns for eight hours a day, but for them the alternative school was a refuge, and they kept it that way. Then in the early v´90s things began to change. Schools were pressured for more student accountability. More standardized tests were introduced; course requirements were increased; and attendance and dropout rates were more closely looked at, at the same time that education budgets were getting tighter. As a result, students who before might have been subtly encouraged to drop out; shunted off to GED programs; or put on homebound tutoring (a sure bet, in my experience, that a student would disappear--a quick solution to the district’s attendance problem), as well as those with addiction or emotional problems, were shipped out to alternative programs like ours. Now, the kids getting off the school buses from their hometowns were angrier, more troubled, more reckless, more hounded by the wolves--crack, AIDS, guns, abuse--that increasingly hunted the hood. At the same time, the media was increasingly filled with stories about out of control teenagers. We were told that America was a riot of carjackings; gang wars; random and senseless violence; attacks against ordinary middle-class citizens. Although teenage crime-- grist for the local news mill--has always been overreported (even though it accounts for only 40 percent of violent crime statistics overall), the national media more and more sensationalized and, in a perverse way, romanticized it. The war on crime was brewing into a war on kids. But as those of us who worked with the young people demonized by this coverage knew, only one side of the story was being told. News reports rarely told about families shattered by crushing economic pressures and unemployment; decaying neighborhoods; or about grandmothers burdened with second families birthed by the loss of an adult child--and parent--to addiction or disease. And rarely reported were the desperate lives these teens led in juvenile care, rehabs, or psych hospitals, or--when all else failed--on the open road. Yet, in the face of all this, the alternative school where I taught remained a sanctuary even while, like everywhere else around us, our budget and staff were cut despite our population’s neediness. Some days it was more like a triage center and emergency room than a school; but we all worked to maintain that sense of security. Until one day the campus erupted, the police were called, and safety disappeared. Bono was one of those new, more damaged kids. At fourteen, the smallest and youngest boy on campus, everybody liked him, so everybody liked picking on him in that good-natured “talking trash” way that adolescents get into. But good-natured “talking trash” became trash, and Bono had had enough. Before the staff knew what was happening, kids poured out of the classrooms into the parking lot ready to settle scores none of us knew they were keeping, swinging fists and knives and weights stolen from the gym. In the confusion of attack and arbitration, I was knocked down. After the police were called and the melee was over, and I found my glasses, I began to see things differently.